Some Shell employees complained on their website Royaldutchshellplc.com that a “Swiss Mafia” is running the group. Meanwhile, staff flocked to Royaldutchshell.com to attack the groups management. Influential? you bet. The Donovans and their blog are regularly quoted in the mainstream media? no doubt that the father-and-son team is an ongoing headache for Shell. We have published below a selection of links to newspaper, magazine and book extracts featuring comments/reports relating to this website. On 2 August 2006, Fortune magazine published a feature recommending the website as a source of information about Royal Dutch Shell. On 11 June 2007, Ed Crooks of the Financial Times described it as an anti-Shell website run by a father and son partnership that has been a long-running thorn in the company’s side. On 1 Sept 2007, The Daily Mail published an article headlined “Shell on backfoot as gripe site alleges safety concerns.” It reported that Shell had been “rattled and put on the “back foot” by a campaign involving the website. On 21 December 2007, Reuters published a news story with the headline: “Shell to cut thousands of IT jobs.” The article said “One employee told the Shell protest website RoyalDutchShellPlc.com that 3,200 jobs could be lost?” Many news sources subsequently picked up the IT outsourcing story including the Financial Times, The Wall Street Journal, The Daily Mail, The Independent, The Guardian, and the Daily Telegraph. On 25 January 2008, Carl Mortished, World Business Editor of The Times newspaper wrote an article headlined: “Shell chief fears oil shortage in seven years” in which he described the site as “an independent website that monitors the company.” The story was a genuine scoop being the first acknowledgement by a major oil company CEO of an approaching “Peak Oil” crisis. On 19 November 2007, Dow Jones Newswires published an article under the headline: “US Court Paves For Shell Reserves Settlement To Proceed”. It said: “The ruling was first obtained by Shell critics? Website Royaldutchshellplc.com, which has posted 2,000 pages of extracts from the case.” A law book published in June 2008 contained a related fact, namely that: “A non-US shareholder, Mr Peter M Wood, was recruited into that action through an appeal on the website – http://www.royaldutchshellplc.com. 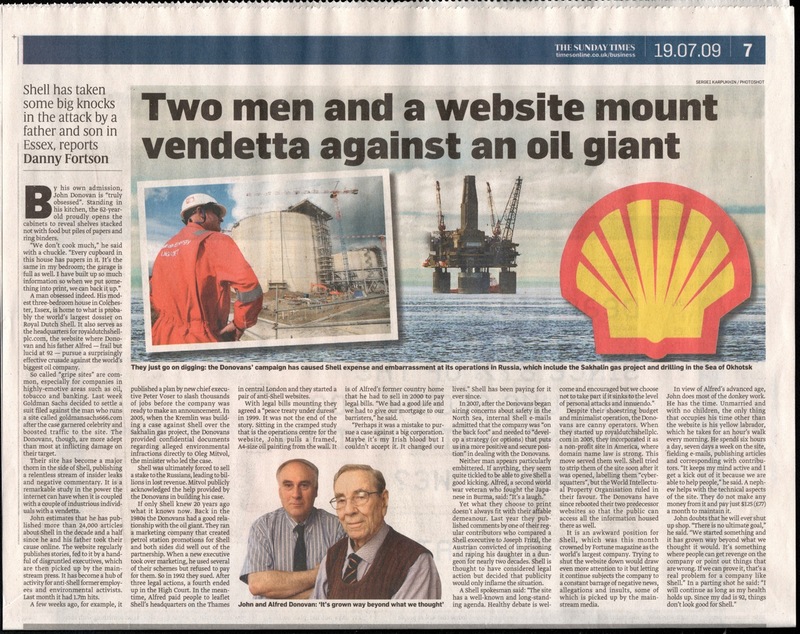 A Scottish newspaper article (The Herald) also published in May 2009 said: Some Shell employees complained on their website Royaldutchshellplc.com that a “Swiss Mafia” is running the group. On 30 May 2009, Reuters reported: The Royaldutchshellplc.com website was the first to reveal news of the planned restructuring. In June 2009, The Wall Street Journal reported: “An internal e-mail from Royal Dutch Shell PLC (RDSB.LN)leaked to a blog critical of the company has revealed the appointments of 62 senior executives to new roles within the restructured company. The e-mail dated June 16, sent by incoming Chief Executive Peter Voser, was published Saturday on the blog royaldutchshellplc.com. 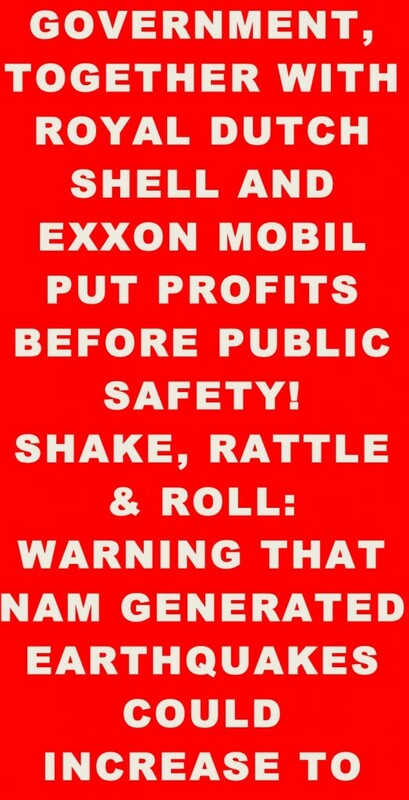 A Shell spokesman said the company does not comment on purported leaks. In July 2009, The Wall Street Journal reported a deepening of the restructuring and said that the website Royaldutchshellplc.com had obtained a list of over 300 vice presidents involved in the changes. Extract: A few weeks ago, for example, it published a plan by new chief executive Peter Voser to slash thousands of jobs before the company was ready to make an announcement. In 2005, when the Kremlin was building a case against Shell over the Sakhalin gas project, the Donovans provided confidential documents regarding alleged environmental infractions directly to Oleg Mitvol, the minister who led the case. Shell was ultimately forced to sell a stake to the Russians, leading to billions in lost revenue. Mitvol publicly acknowledged the help provided by the Donovans in building his case. Extract: The site is so successful that Kremlin officials and US investigators have used it. Journalists, knowing that the site regularly receives juicy leaks from Shell employees, search it for stories. In October 2010 a book about the Corrib Gas controversy was published. In March 2011, a book about crisis management was published containing a section referring to our activities. In April 2011, The Irish Times reported that The Gardai were investigating alleged death threats against Corrib gas project insiders who hah leaked information to John Donovan. In March 2012, a book was published giving advise on how to set up an “Interactive Hub of Dissent”. 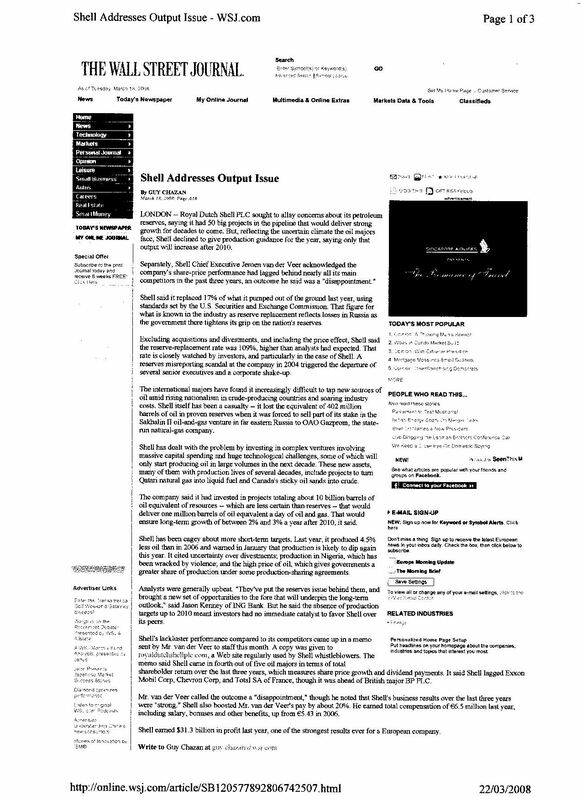 Much correspondence between Shell and OSSL is posted on a website which then came to play a key role: royaldutchshellplc.com, run by John Donovan and until recently his father, Alfred, who died last month. The site, a thorn in Shell’s side, is a watchdog on the company and repository for material leaked by whistleblowers and discontents, with more than 30 million monthly hits. The Donovans had secured places for Kane and Rooney at Shell’s AGM last month, to raise their grievances. Cornered, the company’s CEO, Peter Voser, suddenly ordered a further inquiry, a move echoed by the Garda. With more reference in an article published in Ireland towards the end of 2013.